Parts 1-15 of this series tried to look at what got the territory into its budget crisis and what might help get it out, concluding true recovery would take both disciplined reforms at home and focused congressional action. The final four segments will look at how things stand in the wake of this year’s two devastating hurricanes. The territory already had an unsolved major budget shortfall in September when Hurricanes Irma and Maria dealt the U.S. Virgin Islands a massive economic punch to the gut. Problems that seemed intractable a year ago are now much worse and will require much more help than seems to be on the table. Virgin Islanders should prepare for a bumpy ride. The solutions have not necessarily changed. For the most part, the same measures that were necessary before are that much more urgent now. On the plus side, the twin disasters have focused the minds of some in Congress, potentially making vital reforms to Medicare and Medicaid more likely. And unable to borrow before the storms, the territory now has access to a federal line of credit of at least $500 million and maybe as much as $800 million, thanks to disaster assistance from Congress. Tens, if not hundreds of millions of dollars in disaster assistance is pouring in and more is on the way. On the other hand, even with every dollar of assistance currently on the table, the economic blow to the territory is so severe that, even after adding $371 million in federal disaster loans, the central government is looking at a shortfall of at least $203 million and no plausible way to make up the difference. The teeth of this dilemma should prompt the V.I. Legislature and government to focus hard and fast about its next steps. The questions are not easy. If the territory has too much debt and will remain unable to borrow in the marketplace, does it make sense to change V.I. law to reduce its financial options in a vain effort to reassure lenders who are not going to lend? If the government is going to be dramatically short of cash to meet its bills, where should the cuts be? Should employees pay more out of pocket for insurance? Or should the government layoff teachers and double classroom sizes? Layoff police officers? Shut down public assistance operations through Human Services? Failing to act with purpose will mean those decisions will make themselves, in the midst of crisis, without any coherent plan to minimize the public harm. If the Legislature does not stop playing hot potato with unpopular moves like increasing employee insurance contributions, the lack of money is going to force worse things to happen by default. In January, the government tried and failed to sell bonds to finance its current year deficit of $110 million. 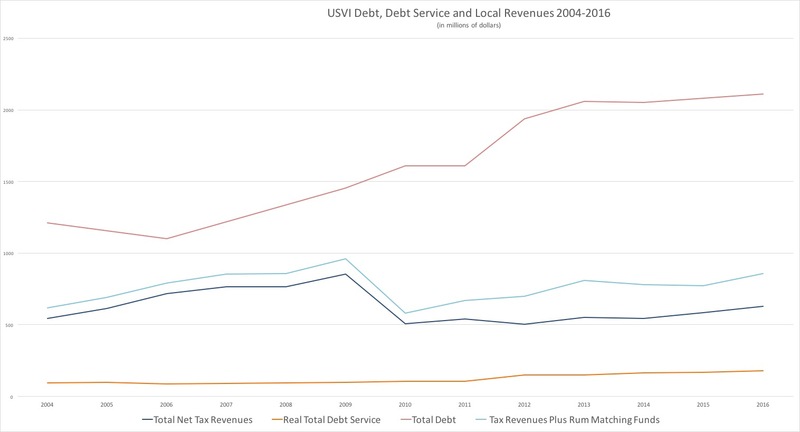 The same month, Greg Clark, head of municipal research for Debtwire, an influential subscription-based financial news service for investors, told the Source it is “very possible” the USVI will have to restructure its debt. There have been storms before. But it could borrow heavily then, in the expectation of being able to pay the loans off in times of plenty. Now the government has more than $2 billion in direct debt and annual debt payments around $177 million. The private sector already turned the territory down for loans, months before the storms hit. The local hospitals were already underfunded and struggling to stay open and certified, unable as a rule to pay tens of millions of dollars in utility bills every year and relying on the Water and Power Authority to not dare to cut them off for nonpayment. The Gov. Juan F. Luis Hospital on St. Croix is being sued by a software vendor for more than $400,000 in unpaid bills. Both hospitals were devastated by the storms and both are suffering major drops in revenue. WAPA was being sued by one of its fuel suppliers for not paying for fuel and failing to complete a conversion from burning oil to cheaper propane, partly due to financial constraints. The government also already had a $3 billion-plus unfunded pension liability. Two years ago, analysts projected the pension system will cease being able to pay full pensions by 2023. But the government is no longer consistently paying in, so it could face a crunch by 2020. Pensions would have to drop to less than half their current amounts. If it happens, the sudden drop in spending by some 9,000 retirees would itself depress the economy even more. In 2016, Gov. Kenneth Mapp’s administration proposed a five-year plan to reduce annual structural deficits of around $170 million per year deficit that relied on a massive increase in revenues from V.I. tax break programs. For more than a decade, Gov. Charles Turnbull and John deJongh Jr. also prioritized growing the tax break program to little avail. It is not clear why this effort will be much more successful than the past decade of efforts. If the plan works as hoped and unprecedented explosive growth in the V.I. 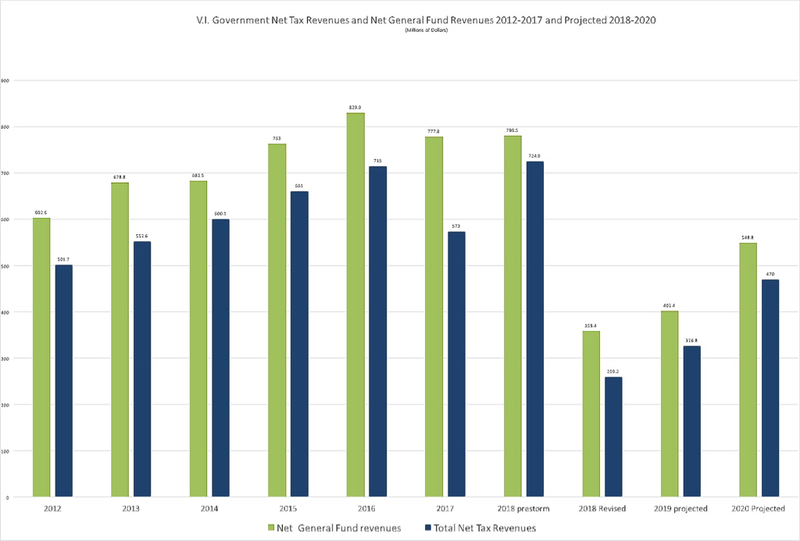 tax break industry generates all the revenue projected and if senators actually do unpopular things like cut budgets, hike taxes and increase employee insurance contributions, the government will still have massive shortfalls for the foreseeable future. A year ago, Finance Commissioner Valdamier Collens told senators that if all went as planned, there would still be a $56 million permanent, annual deficit after five years. That was before the storms. On Sept. 6, Hurricane Ira slammed into St. Thomas and St. John, closing its ports, damaging, homes, schools, hotels, businesses and crippling its hospital. At first, while the damage to the St. Thomas-St. John district was bad, it looked like there might actually be a big increase in economic activity on St. Croix, with cruises diverted from storm-damaged ports in neighboring countries and reconstruction crews setting up their bases of operation. Maria dashed those prospects on Sept. 19, dealing an unprecedented one-two punch to the territory. Along with billions in property damage, hurricanes Irma and Maria have wiped out a peak tourism season across the territory, shrunk economic activity to a fraction of its usual level and greatly reduced tax collections to run the territory’s schools and agencies. Mapp’s financial team told senators in late November they projected a $1.5 billion loss to the V.I. government over three years. That’s more than the entire annual V.I. government budget from all sources, including federal funding. Budget Director Nellon Bowry recently told senators the administration projects a $453.6 million shortfall for this current year. That’s more than a third of all V.I. 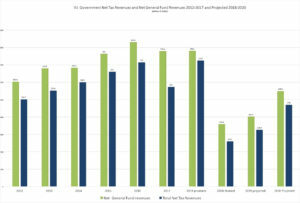 government revenues from all sources, including federal funding. It is more than half of all local funding. These difficulties may seem insurmountable. And they are high hurdles. The Mapp administration’s most recent revenue projections suggest this hit is temporary and revenues will return to normal levels in three or four years. 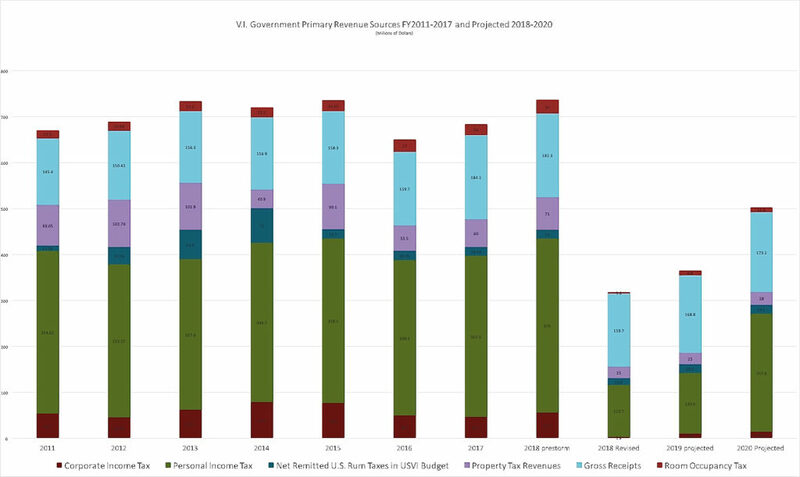 If enough assistance arrives and if the territory can get its budget in line with revenues, the USVI can begin an upward swing. It is not yet clear that enough federal help is on the way as of yet to clear that hurdle.